In a move i can only assume was because of Disney's wild success in turning a theme park ride into a huge movie franchise, the people at Hasbro decided to make a movie about a board game you've probably spent many years playing with the old red and white pegs. If you were lucky and a kid int eh 80's you may have ever had the electronic version as i did with missile and explosion sounds. 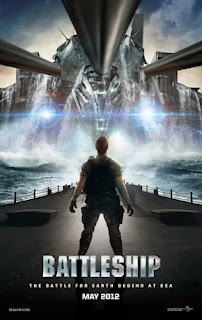 Battleship has been made into a movie. When i first heard of this i was really stunned since i couldn't figure out how this would work. The premise for this movie? Aliens. I tried so hard to wrap my head around that and just gave up. Having seen the movie i'm still not sure what they were thinking. The movie is directed by Peter Berg, from Chicago Hope who moved behind the camera for Friday Night Lights. This is Rihanna's first movie and she sure does have a big role in it which was unexpected, she needs a few more films under her belt because she was struggling thru some of this film. The movie also stars Taylor Kitsch. I feel a bit sorry for him following up John Carter with this movie, but he plays Alex Hooper a lose cannon with 1 foot out the door in the Navy. He's only there because of his older more disciplined brother Stone, played by Alexander Skarsgard told him he needed to clean up his life after a taseing incident which is hilarious. Also in the film are Brooklyn Decker as Alex's girlfriend, Hamish Linklater as the scientist who is part of the reason the aliens are on their way here and Liam Neeson the hardest working man in show business next to Samuel L Jackson. I swear those 2 don't ever turn down a script. Like i said the movie is about Aliens who come to earth because the scientists have been sending signals out into space to find a planet that mimics earth in another solar system. A bunch of US and Japanese ships are out off the coast of Hawaii for the RIMPAC training exercises when the aliens land in the Pacific Ocean. On their path to earth their communication vehicle gets damaged and crashes in Hong Kong. The remaining aliens land right in the middle of the training exercises and of course nobody knows whats going on and when the protective barrier is raised locking 3 ships on the inside and the rest of the massive fleet on the outside, all hell breaks loose. The plot is contrived, the ending was way too bizarre and all of a sudden you are left saying that's it? There's some very cool military bassassaery in this film, Gregory D. Gadson is a double above the knee amputee and he is pretty damn awesome in this film. When the crew goes for their last ditch effort to try to defeat the aliens they decide to take the USS Missouri, the battleship which is now a floating museum complete with gift shop, but thats where the retired all guys come in and i swear i love when seniors get all badass, they know how to make this ship move and so its go time. The story jumps all over the place, the way to defeat the aliens is dropped halfway thru the film, there's some random misunderstood references to the book Art of War, and the unintentional comedy in this movie is thru the roof. I don't think this movie was supposed to be a comedy, it didn't feel forced it felt like the way it was setup you just had to laugh at how ostentatious it was in parts.there were parts a few laughed, parts have the theatre laughed and parts where everyone was hysterical yet it all felt like this was slightly wrong. It was entertaining but i'm not sure it was supposed to be entertaining that way. The action was OK not amazing, the acting was stiff in parts and there wasn't anything in particular to just pull you in, the movie was just all over the place. Battleship is rated PG-13. They made use of the creative editing out of the the f-bomb they same was Live Free or Die Hard did to not have an R rating. I don't like that use and i can't say this is a kids movie anyway. The movie opens May 18th. I give this movie a Redbox. Its funny again probably not intentional but its really not that great of a film and the plot is contrived and messy.